This set of Instrumentation Transducers Multiple Choice Questions & Answers (MCQs) focuses on “Capacitive Transducers”. Explanation: Capacitance of a material is affected by area and distance of separation of plates and dielectric material. 2. Capacitive transducers cannot be used as strain gauges. Explanation: Strain to be measured is applied to parallel plates of capacitor and total displacement change will be proportional to strain. 3. Which of the following is correct for capacitive transducer? Explanation: Capacitive transducers find application in measurement of both strain, pressure and angular displacement. Hence all of the mentioned can be treated as application of capacitive transducer. d is the distance between plates. 5. Which of the following is correct for moisture transducers? Explanation: Dielectric constant of pure water is 80 which is much greater than other materials, this characteristic helps in measurement of moisture content. 6. Which of the following device is used for measuring relative humidity? Explanation: Hygrometers are special devices, which are applicable for measuring relative humidity of a medium. 7. 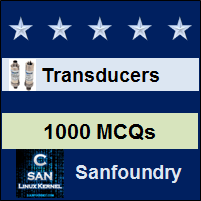 Which of the following quantities cannot be measured by capacitive transducers? Explanation: Capacitive transducer finds application in measuring almost all quantities like displacement, thickness, moisture speed etc. 8. Which of the following have high relative permittivity? Explanation: Dielectric constant or relative permittivity of Bakelite is about 4.4, for marble it vary from 8 to 10 and for paraffin it is only 2.2. Explanation: In microphone electric signals are produced according to pressure variations caused by acoustic waves, which can be easily measured by displacement transducer. 10. Thermometers are not possible using capacitive transducer. Explanation: Capacitive transducers can be used to measure temperature in a way similar to moisture measurement.